This stew was inspired by a vacation—it was time to clear out the fridge, stoke up on immune boosting beta-carotene and have leftovers in the freezer upon our return home. 1. In a 5qt saucepan, sauté carrots and onion over medium heat. 2. Add remaining ingredients, except pear. Bring to a boil, then lower heat. 3. Cover and simmer for 30 minutes or until potatoes are fork-tender. Add more broth as desired to thin it. 4. Add the pears during the last 5 minutes of cooking. 5. Enjoy this very filling stew with a toasty piece of sourdough bread! 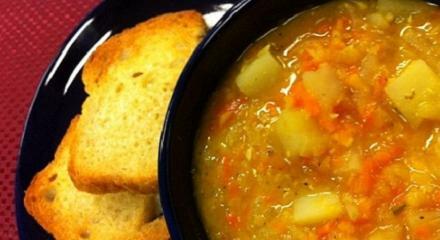 Red lentils are best for this recipe since they cook so quickly and get very tender. I have not cooked with lentils before, does it matter if you use green or red in the recipe? This stew will work fine in a slow cooker. But, you’re right about the pears breaking down. I would use a ripe pear, that is already relatively soft, and add it during the last 15 minutes of cooking. I usually make stews in my slow cooker but I’m afraid the pears might break down and get mushy. Have you tried slow cooking this stew, and if so, what were your results? Thank-you for your great post, its really intresting and mouth watering. Its easy to prepare and very intresting to read. Definetly ill try this tonight. I tried this recipe and loved it. I made a double batch to freeze and made it in the microwave instead of a saucepan – it turned out great. Cheryl, thanks so much – I’m glad you enjoyed the stew! Moonwatcher – thanks so much for watching the videos and your kind words. I do love making the videos because I feel like it helps our students overcome their hesitations of trying the diet. You may also want to check out DelectablePlanet – lots and lots of video recipes (they film the PCRM videos). ps: by the way, Katherine, right now I am practically living on mashed millet and cauliflower, which I love to distraction, for some reason, and another favorite of mine is your creamy broccoli soup. Thank you, thank you! This stew sounds great! I read about it here just yesterday. Then today I found myself watching a video for Savory Potato Pear Stew andI put together that you are the Katherine Lawrence in the Food for Life Videos on PCRM. Thank you so much for all your recipes and demonstrations! I have been eating this way for almost 3 years now, due to having MS, and even 12 years after diagnosis it has helped a ton. Plus, I am hoping to prevent further health problems, such as heart disease, cancer and diabetes, all of which run in my famly. Susan’s web site and blog is one of the first and best resources I have used, and I thank you both for your inspiration in the kitchen. It truly has been a life saver for me. I have a pear tree, so next fall you can bet I will be making this, but I probably won’t be able to wait that long! I made this tonight and it is definitely one of my favorites. Savory, scrumptious, healthy, yummy!